The unthinkable has happened: someone has stolen your identity and now your credit score has been affected. You cannot get that new car you have been saving up for, you cannot get a home loan, no new credit cards, and that new cell phone you wanted now has a $600 deductible on it all because your credit has been affected. What do you do now? Where do you start? How can you rebuild your credit after something like this? 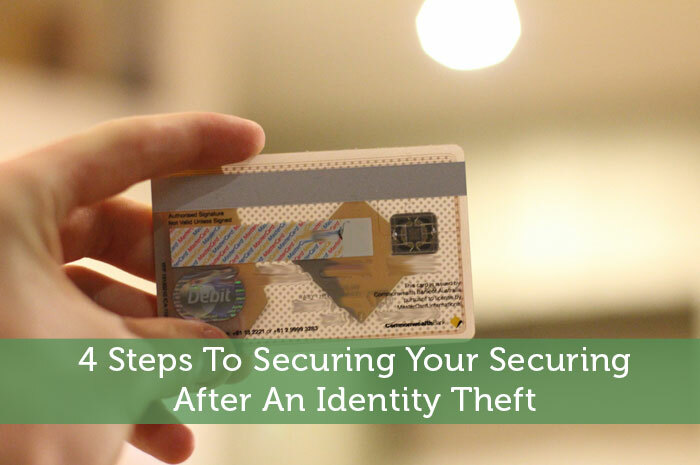 Here are four steps that you can take to secure your credit after an identity thief has played with your good name. Many people forget this step, especially since the crime didn’t happen at your home or anywhere really locally, but you must file a police report as soon as you realize you’ve been a victim of identity theft. The police can also help you fill out or file any other reports that you need to, such as with a local identity theft task force and so on. Having the main police report number is key to starting to remove items from your credit. If you have never filed a police report before, it is very easy. You simply need to head to your local police station, and you can easily find the address to the closest one online. Once you are there, talk to the person at the information desk and inquire where you need to go to file a police report. They will ask you a few questions, such as what you need to file a report over, to determine which area of the department to send you to. You will then meet with an officer or a detective and file your report. Be prepared to answer questions, have specific information (such as the dates, times, and other details about what has been done with your information), and generally be ready to let the officer know anything possible to help them with their report. Get the report number before you leave because you will need it for the next few steps. Ask to meet with a customer service member at your bank, and let them know that you have had your identity stolen. They will need your police report number to fill out their paperwork and you will need to sign some paperwork there as well. I would suggest that you have any bank cards and credit cards through your bank canceled and new ones sent out to you immediately. If you do this, it does mean a bit of work on your part but it will also mean that any id thief that has this information can no longer use it and do more damage. Also, if you have had checks stolen, make sure that you let the bank know this so they can cancel those checks and reorder you new ones. You should also get a print out of your account for the past few months (or longer if you are unsure when the problem started) so that you can look for any suspicious charges on your account. Sometimes seeing things on paper in front of you can help you see them better, circle or mark any charges that you are unsure of. Take your time and go through your statements completely, you never know when something might slip through because you’re in a hurry. Once you go through them thoroughly, your bank can then help you file disputes on items or provide you with a way to dispute them. Once you’ve been a victim of identity theft, you are entitled to a free credit report from each of the three reporting bureaus. You will have to call each one to find out how you can request one, some only take requests in writing, others allow you to do it over the phone. Tell them that you have had your identity stolen and that you have already filed police reports. Once you get your credit reports back, this is where the fun begins. You will need to go through each report thoroughly, and I mean with a fine tooth comb. Start with the very first thing on there and contact that company for more information if you aren’t sure what the charge is for. On a separate piece of paper, you need to make a list of the things that are not right and which report they are on. Once you have gone through all three reports and have your list, you need to start drafting letters to each credit bureau for each different dispute. You need to list the charge on your credit, why you are disputing it, and list the police report number. Mail these out to the different bureaus and follow up with each dispute about 3 weeks later. After you have followed up with them for the initial time, you want to stay on them. Follow up every week, or more, if you are not getting the response you need. Make sure that you keep records of who you have talked to, what was said, and what the outcome of the conversation was. This way, if anything falls through the cracks you can escalate the dispute with a manager or other supervisor. This step can easily be done while you’re doing any of the other steps, but that doesn’t mean it’s less important. Start looking into different types of identity theft protection companies that offer guarantees and can lock down your credit and your information quickly. Lifelock is one of the main companies out there that offer identity theft protection and one that also allows you to customize your service to your needs. Any company that provides this type of service should be able to help you with keeping tabs on your information in case someone else tries to use it again by alerting you if someone tries to open an account, use your credit, or change any of your personal information. If you aren’t sure which company to go with, I recommend that you check out some of the different identity theft protection reviews out there on the web. It is easy to sort through them to find out which offers the best protection for your needs. Make sure that you go with a company with a guarantee, as well as one that you can afford. Don’t go with a company that you don’t feel 100% comfortable with knowing your information. Having your identity stolen is never a fun thing, and you will spend a ton of time cleaning up the aftermath. But if you do not take the steps to stop the problem from growing or to dispute charges and other problems with your accounts, it won’t take long before the problem starts to get you into big trouble. I always tell clients and friends that you want to be proactive against identity theft, not just wait around like it will never happen to you. I have never had my identity stolen, but it is something I am always freaked out about happening! Hopefully it never does, but thanks for the tips! I agree Holly I’ve never had mine stolen either and I hope it doesn’t happen. In fact I’ve gone to great lengths to make sure it doesn’t. The truth is with my name being out on the internet as a personal finance blogger I’m sure I could be fairly vulnerable. In fact I even signed up with an identity theft program to protect myself. Anyways, I’m glad you liked the article. I actually wrote a previous post about this how personal finance bloggers might be a lot more vulnerable. In addition to their names being out there, they are often posting specific financial details which could get used against them. Even posting your birthday can be risky. That’s exactly why I don’t put my financial info out on my blog. I know guys like Pat Flynn and other big financial bloggers do that but I’d almost be to afraid someone would steal my info and use it against me. It’s bad enough they can steal my identity with the limited info they already have why would I possible want to give them any more. Just my thoughts I guess. I’ve met a few people that have had their identities stolen and it really puts a strain on their life, especially if they didn’t have money saved in other areas. I’ve been fortunate and haven’t had an issue yet but I appreciate the advice and knowledge in case the event happens. I knew about contacting the police but I think I would have done that last after contacting my bank and credit card providers. Good to know it should be done first! I’d probably leave the cops until last too. I’d just assume there wouldn’t be much they could do about it. Apparently identity theft can be very expensive and time consuming to deal with. So any steps you can take to prevent it is well worth the time. I’ve never had my identity stolen, but have had fraudulent credit card charges, and it is really scary. I would have never thought to call the police. Good tips I hope I never have to use. I would think most people would get fraudulent credit card charges at some point. That is much easier for scammers to pull off rather than full identity theft. I know it’s happened to me more than once. Good info to know! I wouldn’t have thought of the last step, but I suppose it would be pretty important as whoever stole your identity has all the info to do it again pretty easily. Yeah how frustrating would that be to have your identity stolen all over again after cleaning things up. It’s just like the burglar who breaks into the same house twice within a week or two. Great advice! I haven’t had this happen, but I know it could. I reviewmy credit reports every three months and always carefully go over all my monthly statements, so hopefully I’d catch it pretty quickly. That’s good that you check your credit that regularly. That at least limits the amount of mess there would be clean if something did happen. The best strategy is prevention though. Getting your identity stolen sounds scary. Thank god I’ve never had this happen to me! My brother did at one point have charges made to his bank account from an Asian country heh. I can’t recall what he ended up doing about it – maybe I should ask. I’ve heard that a bank account being compromised is much worse than it happening with a credit card. The credit card companies provide all kinds of protection and always seem to reverse such charges. I knew someone who had that happen with her bank account and she really had to fight to try to get her money back. I’m not sure if she ever got her money back either. That’s a good point Jeremy credit card companies will usually work with you to get the situation fixed but banks are a whole other story. lol I was in the same habit in the past too. It’s better to be safe than sorry. At least make it tough for anyone. So if they want to get that info they’ve got to find all of those pieces and do a little puzzle. I’ve never had mine stolen, but I do take safeguards. It sounds like a real pain when it does happen and incredibly time consuming to get your name cleared. Thanks for posting the tips, though I hope I never need them! In the past I had no idea how time consuming and expensive it would be to get your identity stolen. For some reason I just always assumed it was something that could just be reversed with a phone call. If only it were so easy. For sure, the more you know, the quicker you can take action to clean up the mess. Without knowing what to do it could be a lot more stressful. Plus with enough knowledge you can take steps to prevent it from even happening. This is awesome! Thankfully, I’ve never had to deal with this yet but it does seem that it can happen at any time to anyone. I’ll definitely bookmark this page as a guide of what to do should this ever happen to me or anyone I know. Yeah there are all kinds of ways identity thefts can get access to your info. Even if you think are taking all of the necessary precautions, they might get at your info in some way you hadn’t thought of. The worst part of getting your identity stolen from my perspective? It’s the time you’ll never get back. I can get money back or “things”, but the time it takes is very frustrating. I agree. Time is the most valuable commodity. Who wants to spend all of that time fixing your credit and undoing all the damage done. I totally agree in most cases credit card companies will return the money but the time spent to fix it will be lost forever not to mention you’ll probably be a nervous wreck as well. Good tips – particularly contacting the police. I’m sure a lot of people wouldn’t think of that. For sure, contacting the police sounds rather crucial. That shows that you are seriously fighting it and not trying to scam the system yourself. Plus it might help ultimately catch the culprit. Step 5: Make sure you never loose your copy of the police report in case something comes up 10 years down the road, like what happened to my wife when Paypal closed her 6 year old account because she “owed” money from when somebody opened a fraudulent account in her name when she was in high school. I agree Edward, I would keep any and all documentation. You never know when someone might dig up the past. With important stuff like this it is definitely worth holding on to that paperwork. I just wonder how long is really necessary. 10 years seems like a very long time, but better safe than sorry. This happened to me four years ago. Someone stole my credit card, and before I found out, almost 18K was charged on my credit card. I filed a police report and called my credit card company right away. These crooks used most of the money at Best Buy and Wal-Mart. But, I never found out who these people were due to privacy protection law provides to them. Yeah it doesn’t take long for these criminals to strike once they do. In fact my sister was checking out of Walmart back a few years ago and the person behind her was able to get a quick glimpse of her credit card. The worst part is she had no idea someone stole her card numbers, in fact within a half hour the credit card company called her and reported that their was some suspicious activity going on. The other thing I should point out is that identity thieves are getting smarter and buying typical things such as groceries, and household items. Doing this doesn’t look as suspicious to the credit card companies versus someone buying $5000 worth of cell phones which will throw up a red flag immediately. It does seem like the credit card thieves tend to make big purchases instead of smaller ones. That way if that purchase sets off a red flag, at least they get away with that one purchase. Plus that kind of stuff is often easy enough to resell. Or with some stores you might be able to return the item and get the amount credited to a different card. It’s crazy that someone can get the number just looking over your shoulder. I know I wouldn’t be able to memorize that long a number just from a glance. There is a program in the UK called ‘The Real Hustle’ where experts demonstrate how easy it is to steal identities. I am always so careful with CC receipts etc. I hate it when some companies ‘X’ oout some numbers – XXXX-XXXX-XXXX-1234 then you go on holiday abroad and another company ‘X’ out different numbers. I always think that someone could put the puzzle together if you hoard enough receipts! That’s exactly why I keep all of my receipts, especially when I use my credit card. You never know when some identity thief is putting a profile together on you to gain you financial information. Even those last 4 digits can be the kind of confirmation an identity theft needs to be assured he has the right info. I know I’ve had to verify just the last 4 digits of my credit card when contacting customer service somewhere. An identity theft could easily use that to get additional info or a copy of one of your bills. So far, I haven’t been the victim of identity theft and hopefully never will. 🙂 I do worry sometimes…but I do my best to avoid it. I have become a little paranoid and gotten shredder-happy; even if just my name and address is on something—into the shredder it goes. I’ve actually been considering getting a shredder but not one of those cheap ones. I want one that cross cuts the paper and instead of just cutting it into strips. I also want one that can handle large amounts of paper at a time. I use to have a cheap one and it plugged up more than it shredded paper. Everyone, I repeat – everyone should have their credit locked to prevent this! I don’t know much about having your credit locked, but it makes you wonder why it isn’t locked by default to protect people. I never thought about that aspect! Personal Finance help bloggers should be very careful indeed. And consider freezing your child’s credit until they turn 18. That is becoming a huge problem. Yeah I don’t see a reason to leave a minor’s credit unlocked. It just opens them to unnecessary risk.